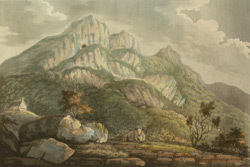 Artist and engraver: Hassell, J. View near the Eldon Hole in Derbyshire. This is known as one of the natural wonders of the Peak District. It is a deep natural cavern on the south side of Eldon Hill. The floor and roof are covered in Stalactite deposits. It used to be assumed that it was bottomless and in 1658 Sir Aston Cokayne of Ashbourne wrote 'Here, on a hill's side steep. Is Eldon Hole, so deep, that no man living knows, how far its hollow goes'. However in 1780 an explorer discovered it was in fact 180 feet deep.